To most of us, chocolate is a delicious brown substance, with no more problems than an expanding waistline or rotting teeth. To dogs, chocolate is also delicious, but potentially lethal. The humble cocoa bean, from which chocolate is produced, contains a chemical called theobromine. This is closely related to caffeine, which chocolate also contains. The toxicity of chocolate for dogs is due to its theobromine content. Chocolate poisoning is very serious. Theobromine is a long lasting, very potent toxin that can cause death. This toxicity is largely unfamiliar to most people, who may not worry too much if their dog vomits after eating a large quantity of chocolate. It is one of the most common poisonings to occur in dogs in the UK. If a dog consumes enough theobromine, (see How Much is Enough? ), the symptoms of poisoning will occur. Initially, the dog will develop abdominal pain and vomiting which may contain blood. The vomit in most cases will contain substantial amounts of chocolate, giving it a very characteristic smell. 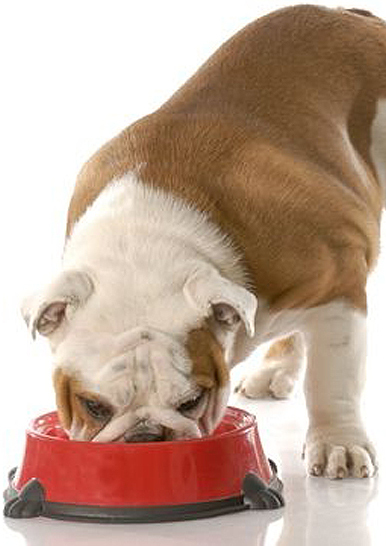 The dog may be restless, drooling saliva and could have difficulty standing or walking. Increased thirst is also common. As the syndrome progresses, in the more severely affected dogs, there is an increased rate of breathing, muscle tremors, or rigidity. Urine may contain blood and the colour of the gums may take on a bluish hue, (this is known as “cyanosis”). Eventually, the dog may develop convulsions and die. In the majority of cases, the symptoms occur within a few hours, but it has been known to be delayed for as long as 24 hours. It can take as long as three days for the dog to recover completely. Practically, this means that white chocolate has the lowest risk of toxicity, and dark chocolate the highest. The majority of cases of serious poisoning incidences (in the UK) involve the continental European types of chocolate, because these contain more cocoa and less milk. There have also been many reports of deaths occurring in dogs that have eaten cocoa powder. The quantity of chocolate that must be eaten before toxic symptoms appear is different for each dog. What could be lethal for one dog, may be no problem for another. According to the Veterinary Poisons Information Service, 130mg/kg was fatal to one dog. Taking this as a base, a 20kg dog (about the size of most Border Collies), it may only require 130x20 = 2600mg of theobromine to be a fatal dose. The quantity of theobromine in chocolate varies, even within the same broad groups mentioned above, but dark chocolate can contain as much as 16mg of theobromine per gram of chocolate. So, dividing our 2600mg lethal dose by 16mg leaves us with a figure of 162.5g of dark chocolate as being potentially lethal to a 20kg dog. That’s about six ounces. Most cases of chocolate poisoning involve dogs that have eaten a whole box of chocolates from under a Christmas tree, and deaths in these, often quite large dogs are not in any way uncommon. Cocoa powder is even more dangerous. It can contain as much as 50% more theobromine than plain chocolate, so as little as four ounces could be fatal. If your dog eats any significant quantity of cocoa powder or dark chocolate go immediately to the vet.DO NOT WAIT FOR SYMPTOMS TO BEGIN. These figures relate to the minimum fatal doses for dogs. Most 20kg dogs won’t die if they eat six ounces of dark chocolate. However, some will, and most will be very ill at the very least. Theobromine has no specific antidote. Chocolate poisoning is in every sense of the word an emergency, and we may not be able to take time to fully discuss treatment options in the first instance. Convulsing dogs require immediate attention, and general anaesthesia may be required to stop the seizures. (See Epilepsy). If the dog is not fitting, then more treatment options are available and the outlook is better. What follows is general treatment advice for the treatment of chocolate poisoning. Every dog is different, and in each case, the exact treatment protocol may have to be adjusted according to the quantity of chocolate thought to have been consumed, and the symptoms that the dog is displaying. In dogs that have only recently consumed the chocolate, if they have not vomited, then vomiting is usually induced. This can be by the administration of drugs such as apomorphine (which very reliably causes vomiting in dogs), or by giving a washing soda crystal orally. Once the vomiting has stopped, an intestinal adsorbent can be given, such as activated charcoal. Intestinal adsorbents slow, or prevent the absorption of toxic substances from the intestines. If the dog is vomiting already, then anti-vomiting drugs may need to be given first, especially if the chocolate was consumed many hours previously. The most commonly used drugs of this type are called metoclopramide, butorphanol and acepromazine. Once the vomiting has been controlled, then intestinal adsorbents may safely be given. This is important because theobromine, once it has been deactivated by the liver, and excreted into the intestines can become reactivated, and reabsorbed again. In almost all cases, the circulation needs to be supported by giving fluids intravenously. Some dogs that have abnormal heart rhythms will need drugs to combat this. Chocolate is digested very much more slowly by dogs than people. Because of this, symptoms may not appear for many hours after the chocolate is eaten. Do not be fooled by this into thinking that everything is OK. The earlier this is treated the more likely you are to save the dog’s life. In addition to this, the very slow deactivation of theobromine by dogs means that the effects of chocolate poisoning can be very prolonged – up to three days, so your dog may need to be hospitalised for all this time. The outlook very much depends on how much chocolate or cocoa powder that the dog has eaten, and how long prior to being seen by the vet that the dog ate it. Experience shows that up to 50% of dogs will die if treatment is delayed until severe, persistent vomiting has developed. If seizures have developed, then an even higher proportion of dogs will die. Treated early enough, except for dogs that have consumed very large quantities of chocolate or cocoa powder, the outlook is generally quite good. Recovered dogs show no long term ill effects from the poisoning.